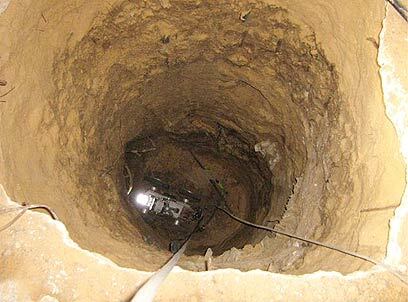 A 3.5-meter (11.5-feet) tunnel dug inside a Palestinian house was uncovered Tuesday during an IDF operation in the northern Gaza Strip. The tunnel was revealed some 700 meters (2,296 feet) away from the Israeli community of Kfar Aza. Military sources estimated that this was another attempt by terror organizations to cross into Israel in order to carry out a terror attack, by moving under the fence or planting explosives under an Israeli target, such as a military post. The forces, belonging to the Givati Brigade and the armor and engineering corps, operated as part of a joint IDF-Shin Bet raid aimed at uncovering terror infrastructures near the border fence. Senior Southern Command officials have recently said that according to estimates, dozens of tunnels are currently being excavated. The military operations are aimed at uncovering such terror attacks while they are still being planned. During the operation, IDF soldiers hit a number of terrorists. Palestinian sources reported that one gunman was killed and three others were injured in the exchanges of fire near the town of Jabalya. The four are believed to be members of the Salah al-Din Brigades, the Popular Resistance Committee's military wing. Some 30 mortar shells were fired at the Israeli forces during the operation. IDF tanks fired back, hitting the terrorists. There were no injuries among the soldiers. Earlier Tuesday, three Qassam rockets were fired from the northern Gaza Strip, two of them exploding at the entrance to Sderot, and one landing in an open area outside the city. Two additional rockets were fired in the afternoon hours, one landing south of Ashkelon and the other within the Sdot Negev Regional Council. There were no reports of injuries or damage in all incidents. See all talkbacks "IDF uncovers tunnel in Palestinian house"